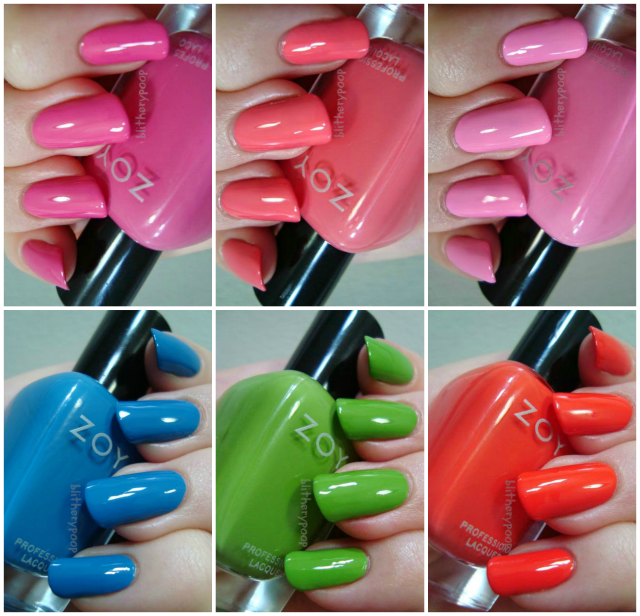 The tagline for Zoya's new Tickled and Bubbly summer collections is "Feel good color" and the bright, summery shades in Tickled reflect that idea to the fullest. I'm not a summery person, but even my head filled with balmy, tropical thoughts while wearing these cheery colors. It may be gray, pouring rain, and 64°F here right now, but it's summer while I look at these swatches! Tickled features six creams in eye-catching colors. Kitridge is a bubblegum pink cream. I was stressing out a little as I was taking these photos. It is impossible to get Kitridge to look as bright in photos as it does in person. You can imagine how relieved I was when I went to Zoya's site to see how their official swatch looked. I also went to check the spelling, since my bottle says Kirtridge. They note that it has florescent pigments that make it difficult to photograph. It's not just me! What a relief! The photo above sorta gets Kitridge's point across, but it's even brighter than that in person. I tested the bottle next to a blacklight and it glows! The formula on shades like this is usually kinda iffy. Kitridge wasn't a disaster, but it was streaky and took three coats to look even. A sandwiched coat of quick-dry topcoat would probably help reduce it to just two coats, since the opacity is good. Since I don't edit my photos beyond applying a watermark, I'll sometimes try a different angle or a different background for a tough-to-photograph color. No plush unicorn this time, but against the wall it looks much closer to correct. Wendy is a melon pink cream. If pink and I didn't have a personality clash, I'd be absolutely crazy about Wendy! Not only is it a pretty, flattering color, but the formula's also quite good. This is two coats. It doesn't self-level, but it's creamy, thick, and goes on really smoothly. It also photographed pretty truly. Rooney is a warm medium pink cream. I was so relieved by the formula of Wendy that Rooney was a bit of a letdown. Even though it's darker than Wendy, it had some streaking issues. It's not as streaky as Kitridge, but I still needed three coats to even it out. It also had some kind of weird pigment globs that kept turning up on the brush. I'm putting the blame on the florescent stuff that Zoya mentions in the blurbs for all three of these pinks. Somehow Wendy got away from the usual quirks of florescents, but Rooney and Kitridge didn't. The color here is, again, close-ish...but not too far off this time. Rocha is an intense red-orange cream with a hint of pearly shimmer. 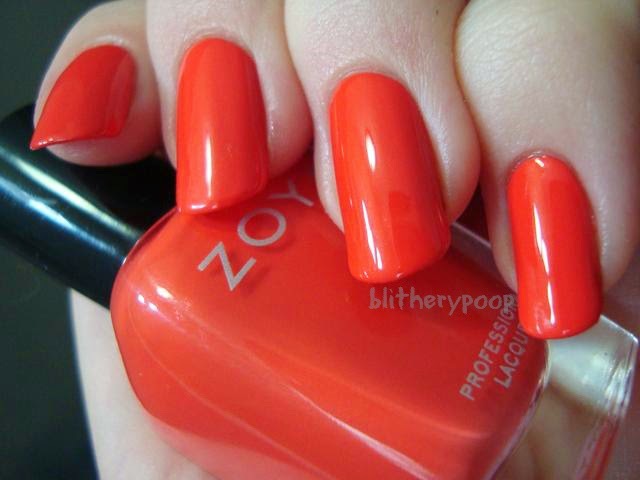 Zoya describes Rocha as "folly red", but the bottle and result on my nails both look decidedly orange. It looks brighter on me than I had expected from the bottle. Rocha doesn't have the florescent pigment that many of the other Tickled shades do. Instead it has a hint of pearl. It reminds me a little of OPI Amazon...Amazoff, in finish only...obviously. Sadly, the formula's not great. It's thicker than I'm used to Zoya being and had some patching issues. I needed a third coat to even it out. Still, it's got undeniable impact and might be the most summery of the whole bunch. Tilda is a yellow-green cream. Another with a touch of florescent pigment, Tilda isn't quite this color in person. It's a little lighter and warmer. Zoya describes it as "mantis green". There is something lovably "buggy" about it. Similar in formula to Wendy, this is two coats and while it isn't self-leveling it's very good otherwise. Ling is an azure blue cream. Something about this shade of blue just screams "Sinful Colors!!" at me, so it's a little jolting to see it from another brand. Zoya did a good job at it though! Formula-wise it's about the same as Wendy and Tilda. Two coats, but not self-leveling. It really REALLY struck me as a Sinful Colors kind of shade, so I wandered over to my collection and found a couple to compare it to. Fly Away and Burning Bright were the closest. It's almost exactly mid-way between the two. They're both limited editions that come and go and I don't think either is around right now. They're also two of my favorite summer blues, so I obviously love Ling too! Bottom line: Wendy, Tilda, and Ling are all easy two-coaters. Rooney, Rocha, and Kitridge are all a little trickier, but even out well enough with a third coat. Wendy isn't a color I'd wear, but it and Tilda are my favorites from this bunch. I know I'm late to the party with these. They only arrived this week, but it kinda works out because they were released yesterday! You don't have to sigh and wait or preorder...they're here! I'll have swatches of Bubbly up early next week, but the three summer Magical Pixie shades haven't come to me yet. 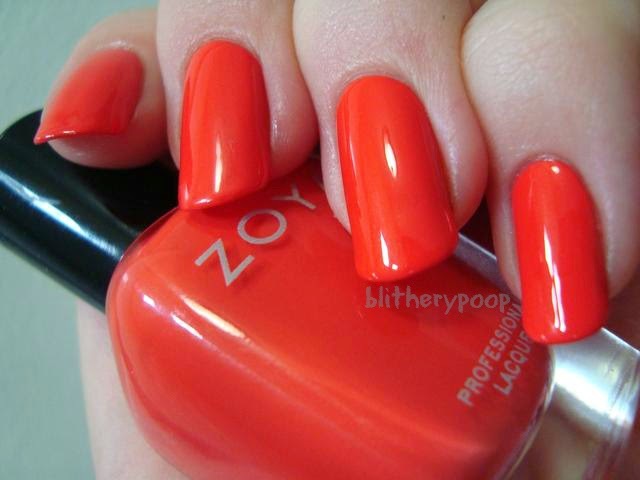 Question about Rooney - you describe it as a warm pink but on the zoya website they have it listed as cool. Isn't a "warm pink" more orange-toned and a "cool pink" more blue-toned? Rooney seems like a cool pink but I wasn't sure if I had the terms confused. Oooh Wendy is right up my alley! I'm so obsessed with melon/coral pinks at the moment! Blogger Wants Me to be Pretty? I Think I'll Call It "Champeal"
Photo Editing: How Much is Too Much?